Build your own traditions within Katy’s palace walls. This is the space for many grand events to be held. In ancient times palaces were built as places of princely pleasure. Honoured guests from all across the land were invited to banquets, balls, concerts and ceremonial gatherings. A palace is a place of architectural greatness with spacious halls, courtyards, secluded nooks and galleries. Taking her inspiration from the great palaces of India and the towers and turrets of the Sandton skyline, Katy’s Palace is one of Joburg’s foremost attractions catering to urban royals, fashionable courtiers and aristocrats of fun. Keeping with tradition, her great hall and well-appointed guest areas play host to parties, weddings, private functions, exhibitions and markets. 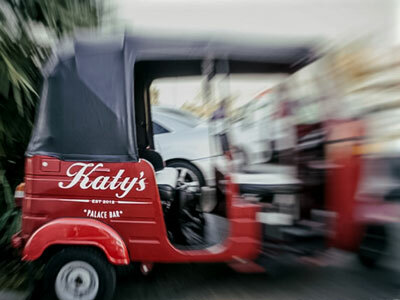 "I’m a massive fan of anything unique and different – and, it doesn’t get much cuter or much quirkier than Katy’s Palace Bar. The only problem with this incredible spot is that it’s not open to the public often enough!" Hire our Royal Tuk Tuk to transport your guests to and from your event. Read more!. Sir James is a specialty bar that caters for the good old times right now. Easy going and laid back with a unique décor that recreates the classic, and mixes in the quirky and a bar fully stocked with the good stuff, this is a fine place to sit back and enjoy the good life. Sir James is the perfect old boy for your bachelor’s, a wonderful new acquaintance to introduce to friends, a billiards aficionado and a great conversationalist. Join him for a glass of your best. Katy's Palace Bar can be booked for private or corporate parties, launches, events and shoots.